Up in the high country of the South Island, thousands of merino sheep give up their fleeces for the making of fabrics and garments. The fleece is spun into yarns of different gauge, then woven into bolts, some of which will be dyed to present a range of colours. A portion of this material makes its way to Takaka-based design workshop Timeless Creations, and under the label Maurice, produces a range of merino knitwear as well as merino felt. Timeless Creations is the proud owner of an eighty-year old derelict German knitting machine, rescued and restored for years of further use. It is also fortunate in Takaka for having access to particularly pure water which is heated for the felt-making process. 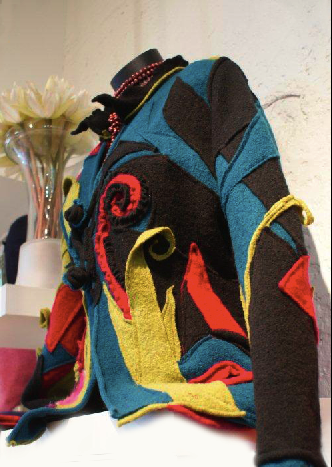 Timeless Creations is the supplier of coloured felt to Nelson-based designer TinaVJ who is the creator of this brilliant, bold coat. TinaVJ’s love of typography and 3D design is apparent in her masterful composition of colour patches and stripes, interlocking panels and the use of big textural motifs which has led her to experiment with her own methods of felt shaping. The robust stitching and playful elements give a sense of daring, yet handled authoritatively. The coats and tunics of TinaVJ are represented by Aquamerino at 97 Willis Street, Wellington. This shop also acts as a showcase for Timeless Creations, as well as the fine-strand merino garments of Aquamerino’s own design and production house. From the shearing shed to the swing-ticket is a great journey, if a journey we can hardly imagine the merino ever had in mind.